How to include or exclude files to load by name, extension, or sub directory name, with a Freeware tool for Windows and Linux/Mac. ALL text files from within that directory tree will be loaded. or .cpp files, but not every .xml or .tmp file. 3. or by creating fileset definitions. or select Setup / Workspace. and read the local help text shown under "additional infos". "load only from filenames", separated by blanks. excludes all files from "tmp", "tmp1", "tmp100"
or sub folders to include while loading, and which not. with extension .svn or starting like tmp or save. as "*" is implied around every plain text word. i.e. "foo" by default means "*foo*". -  very flexible selection of dirs, subdirs, and files. for details see display area size and location. -max       start maximized, covering the whole desktop. (without a master frame, without pull down menu). can be maximized by F1. -noassist  disable assistance mode popups. -clean     disable assistance mode, and scrollbars in vertical tiling. -edit      Pro: if only a single file is loaded, enter edit mode. -isolated  starts with isolated frame mode. you may also use "-iso". -overscan  starts with isolated overscan mode. may also use "-over". (i.e., dir masks starting with "*"). (default if not disabled by Setup). -nosub     do not load subdirectory contents. -hidden    also load all HIDDEN or SYSTEM files (not default). for example of your web browser. -allbin    also load all binary files (extracting text parts). -wrap[=n]  wrap long text lines at current screen width, or column n.
-wrapbin=n wrap text extracted from binary files at column n.
-since     load only files changed since this timestamp, e.g. -before    load files modified before that timestamp. -usectime  use creation time instead of modification time. have been added, have different time, or content. -sinceadd  like -sincedir, load only added files. -sincedif  like -sincedir, load only changed files. does not load files with diff. time but same content. does not load added files. -sincechg  load files with different content, and added files. -umlauts   with binary-to-text conversion, include german characters. -fileset x use a fileset definition. more on that below. -utf       load also utf-16 (ucs-2, wide char) file contents. plain ASCII text contents from those files. caused by a cache overflow. try to increase -memlimit then. with ONE directory name, and MANY file patterns. however excluding sub direcory contents. starting like "save" or having an .svn extension. supporting any number of directories and any number of file patterns. Pro: loads all text files from foo1.zip and foo2.tar.bz2. note that archive files are treated as directories. archive files are loaded as well. file filter is used for both directories. Pro: load all .txt from foo1.zip, and all .cpp from foo2.tar.bz2. in this case, separate file filters are used per directory. sub directory inclusion masks require a wildcard "*"
around sub directory filters, as there are no ambiguities. in their name from foo1.zip, and it will not load anything. use "dview -arc -dir foo1.zip foo2.tar.bz2" instead. ANY archive having ".xpi" or "mysrc.tar.bz2" in their name. what DView really tries to load. # and except names containing "old stuff"
-file -all !.bak !.tmp "!old stuff"
and names containing blanks must be surrounded by double quotes "". 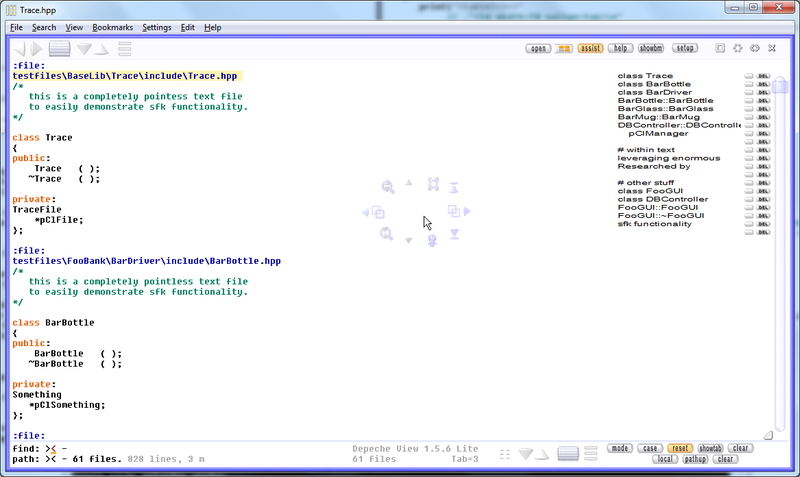 And dview will load the text files as defined in mywork1.txt. which is a collection of text files, then load that at high speed. Find more on that under reducing load times. Then, a double click onto that icon will load that workspace. When using filesets, what will be the bookmark filename? file base name, all others will be ignored. If you want to load bookmarks from somewhere else, read more here. it might be interesting to take a peek into binary files, e.g. to search through meta informations in (smaller) media files. then check "load text from binary files". the "load text from binary files" option. with option "-allbin" and a directory name, e.g. from binary files, which may or may not produce anything useful. contents are NOT loaded, even if you load a surrounding directory. But sometimes it is helpful to load also hidden files. especially "prefs.js". But where are those files? already, it may NOT appear within the Open dialogue. check "include hidden and system files", and close Setup. 2. select "open / load all text from a folder". 3. click into the "folder" text entry field at the bottom. -  then your userid and "\"
further directories within the hidden folder! 4. dview will load all config files of firefox. 5. type "prefs.js" into the PATH: field. Now you should see what the startup config of Firefox is. dview -hidden -dir "C:\documents and settings" "*firefox*"
-  but load only files having "firefox" in their path. dview loads the files from that folder and all its subdirectories. -  click on the load options button right to "open". -  disable "include subdirectory contents" and close Setup. On the next Open or Append operation, subdirs will be excluded. When running dview from the command line, use option "-nosub".